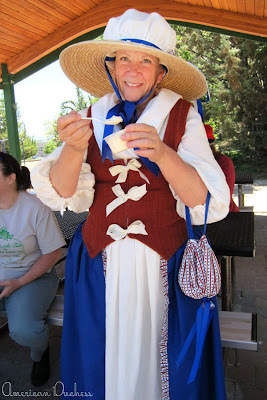 This past Sunday a small group of Great Basin Costumers got together to play dress up and eat ice cream. 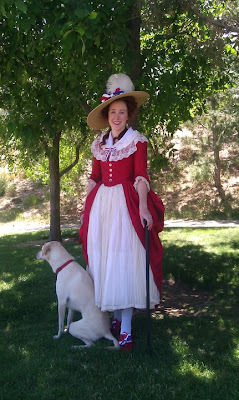 The theme was 18th century, roughly the time between the American Revolution and the French Revolution. 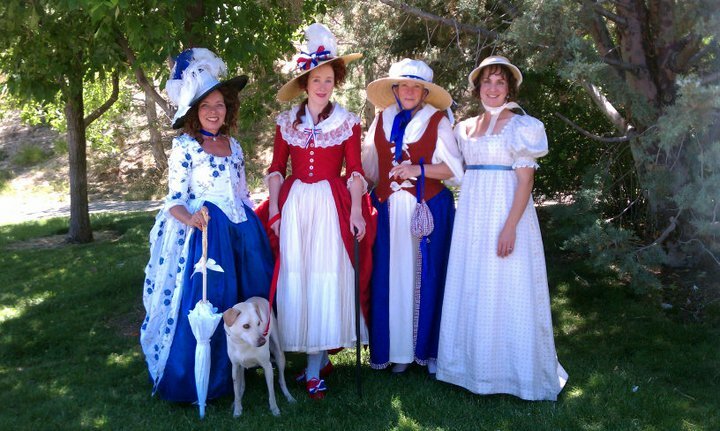 It was wonderful to see what everyone put together, from Lady Carolyn and myself representing the 1780s, to Liza showing off her beautiful new 1790s-1800, and Dana having a laugh at all of us in her patriotic "Betsy Ross" dress. Lady Carolyn's new, gorgeous Robe a l'Anglaise, done in embroidered muslin. 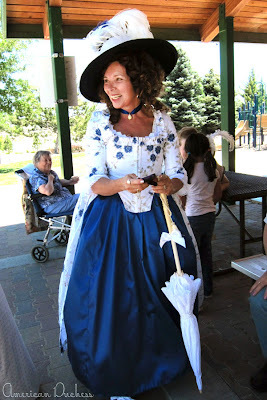 Her wig and Gainsborough were perfect! Lady Carolyn's Georgiana shoes. 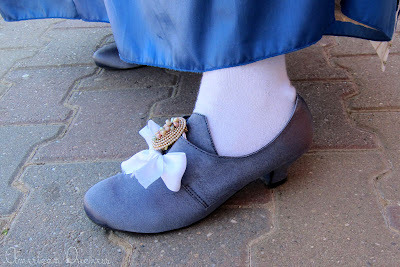 She dyed these herself and dressed them up with bows and beautiful shoe clips. 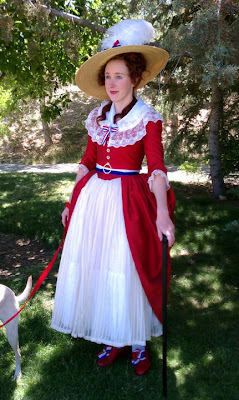 I wore my "Revolution Dress," I made last month for Pirate Faire. 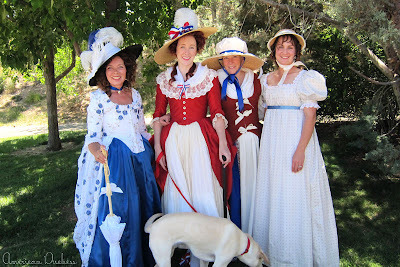 Mom in her patriotic "Betsy Ross" dress. She didn't want to fuss with learning a whole new century of costuming in the short weeks leading up to this casual little social, so she just had fun with some pieces she had, and quickly threw together. Very creative! Here's our group of costumed ladies. 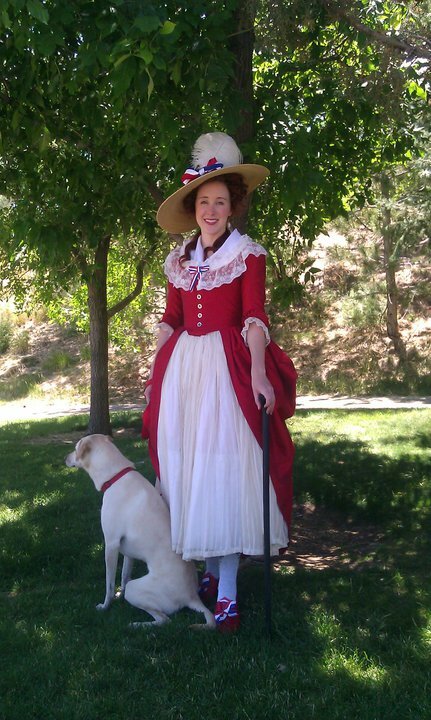 Avi the dog came too - this was her first costume event. She was quite bored. Avi didn't appreciate being confined to the leash. She was in a huff, refused to pose for pictures, and later chewed up a pinecone in protest. This little social was a fundraiser to help raise money for a Steampunk Ball we're putting on in September, at the wonderfully historic Piper's Opera House in Virginia City, just up the mountain. In addition to ice cream, I did a presentation on 18th c. costuming, and we all sat around and gabbed about pretty dresses. Love it! You all look like you had such fun (except for Avi). My Buddy sends Avi his condolences. He got quite impatient at the socks we made him wear for our costume guild's last sock hop. :) He and she are cousins, you know!